Carmel tries to allay Pat's fears. Broadcast on Channel 5 (UK) 31 July 1997 Thu 11:40 p.m. In both this and the next episode Barry Quin's name is spelt "Quinn" in the credits. Thanks to Marie Grahn correcting the name of Leila's neighbour, which I thought was "Sue" for some reason. Pat tries to silence Doreen when she tactlessly mentions Ken in front of Bea, but not in time to prevent Bea blowing up and saying she doesn't care what Ken does. Jim phones Leila when he's on night duty and finds out about the painted message. Judy tells Sharon she wasn't fooled by Lizzie's act, but admits it made her think. Erica calls on Leila on her way to work and finds out that Jim isn't living at home any more. Jim also calls in on his way back from work and Erica has to make an embarased retreat. After she leaves, Jim and Leila have a huge argument which is only stopped when they both notice the children silently watching from the corridor outside. Bea snaps when Sharon mentions the drama group and issues a general warning that the subject is out of bounds. Carmel goes over the appeals procedure with Pat. The police call at the hotel and ask Jim about the painted message implying that the peron responsible might either be Jim himself or Michael Simpson. Caroline gets an anonymous note at the halfway house, accusing her of being a "WHORE" . Carmel asks Paul to get Pat's kids in for a visit to give her a more positive attitude before she goes for her appeal. Jim visits Caroline at the halfway house to tell her about Leila's mystery visitor and Caroline shows him the note she got. Jim dismisses the idea that either Geoff or Michael is responsible for the terror campaign. Andrew and Emma are brought to visit Pat. Sharon moans to Judy about Bea's bad-tempered attitude. The women continue with their rehearsals half heartedly under Bea's scorn for the proceedings. Paul is concerned that Bea's loss of interest will put an end to the drama group. Vera has to admit to Meg that she no longer has the dog and tries to pretend she doesn't care. The police call on Michael at home and while Geoff hides in another room he convinces them that he isn't interested in having Caroline back. Paul gets nowhere getting the truth out of Bea about why she has suddenly taken against the drama group. Geoff phones Wentworth under an assumed name and finds out from Vera that Jim will be working late, so he tells Michael it will be safe for him to deliver the parcel. However, Erica notices Jim being unreasonably harsh to the women and sends him home early for a rest. Paul finds out from Doreen the real reason why Bea has lost interest in the drama group: he thanks her and says he will sort it out. Michael leaves the parcel at the hotel reception desk when the man on the desk says that Jim has left strict instructions not to be disturbed. After Michael leaves, the manager puts the parcel under the desk rather than delivering it straight away. Paul gets Bea and Ken together and leaves them alone together in his office, having primed Ken to casually drop the information that it was his daughter Bea saw. (oddly, Bea does not react at all to the strange coincidence of Ken's daughter being called Debbie...) As Pat goes to her appeal, she remembers her own words to David at his appeal. 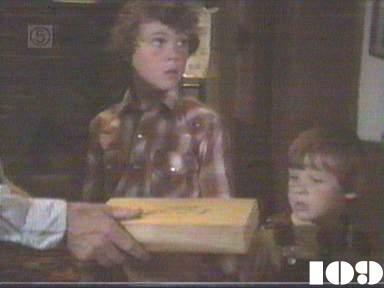 Leila takes the boys to Jim's hotel for a surprise visit, and the manager gives her the parcel to take upstairs . The boys play tug of war with the parcel in the corridor right outside Jim's room , and the bomb explodes blowing the door off its hinges .